The Engineering community strives to provide an exceptional student experience and a nurturing environment that fosters creative and problem-solving skills to prepare our Engineering graduates to embark into leadership roles in corporate, entrepreneurial, government and reasearch careers in a global environment. As a top priority for our Faculty, I am delighted to announce the support of two projects through U of T's Student Experience Fund -- projects that directly link to the Faculty's goal to enhance student learning experiences in academic programs. Our students are exceptional leaders in academics, extracurricular activities and community involvement. Eight outstanding students were recognized on Apr. 8 as recipients of the U of T Cressy Awards. Read their brief bios to learn how some of our students are leading by example and making their marks on the world. Our students are highly engaged in academics and recently took a trip to Guelph to tour the world-leading wind engineering company RWDI, which is led by three-time graduate Anton Davies. An outstanding student experience often leads to an excellent relationship after graduation. With over 4,400 undergraduates and 1,400 graduate students currently in Engineering, we are constantly striving to ensure the best possible learning environment under the leadership of our Vicec-Dean, Undergraduate Studies, Grant Allen, and our Chair, First Year, Susan McCahan. 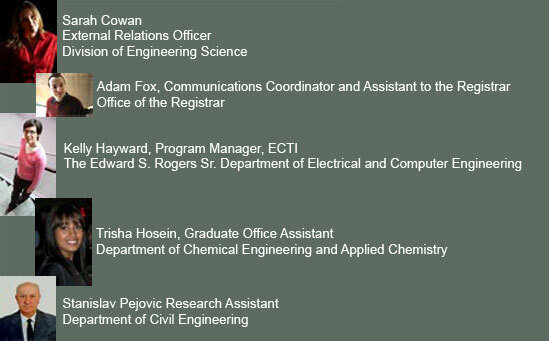 In an issue on student experience within the Faculty, I would be remiss not to recognize the dedication and very hard work of the leadership of the Engineering Society and to extend the Faculty’s gratitude to Alaina Lagrou, President, and her colleagues, Evan Jones, Vice-President, Finance; Edward On, Vice-President, Academic; Robert Jackiewicz, Vice-President, Communications; Eamon McDermott, Vice-President, External; and George Missios, Vice-President, Student Life. It has been a pleasure working with such a talented and committed group of individuals and we look forward to a productive relationship with their successors. We continue to work together to create a unique and enriching environment, which enables our students to grow and become world leaders. I am grateful to our staff, faculty and students for your commitment to enhance our student's experience. I welcome your thoughts and ideas. Professor Emeritus David Boocock received the Society of Chemical Industry's LeSeur Memorial Award. Boocock received the award in recognition of research that led to the commercialization of the Biox process for producing synthetic diesel fuel from waste oils. The award was presented at the awards banquet Mar. 4 in Toronto. Professor Greg Evans, Department of Chemical Engineering and Applied Chemistry, will receive the Joan E. Foley Quality of Student Experience Award, from the U of T Alumni Association on Apr. 16. The award recognizes the efforts of a member of the University community who has made a distinct and lasting contribution to the enhancement of the quality of the undergraduate or graduate student experience at U of T.
Apr. 23 - Energy at the Turning Point: Hydrogen or Electricity?